The 1920s or “roaring twenties” were characterised by a whirlwind of social, technical and artistic change that provided an uncensored flamboyant environment. Accelerated by the war years, the move towards a determined modernity embraced painting, sculpture, fashion and jewellery. Coco Chanel, Jeanne Lanvin and Claris Cliff are names synonymous with this time. The artistic movement that flourished in 1918 was radical, dynamic and very beautiful and it became known as Art Deco. Art Deco pushes past the extravagant forms and evanescent shades of Art Nouveau and represents a return to simplicity and severity. In jewellery, Art Deco finds perhaps its most glorious expression and a virtually unlimited source of renewal. As designers played with colour and texture, like a painter with a palette – they became “sculptors” and “architects” of angle, curve and line. Art Deco has drawn inspiration from the whole stunning spectrum of the arts: riotous colours and explosive combinations from the Ballets Russes and the Fauves, geometric shapes from Cubism, the contrast of black and white from Neo-Plasticism and a fascination with the mechanical world from Futurism. While modern, sleek, and geometric forms dominate Art Deco throughout, the period itself had several trends. 1922 witnessed the Egyptian Revival inspired by the discovery of the tomb of Tutankhamun and an esoteric period followed known as Pumpkin. 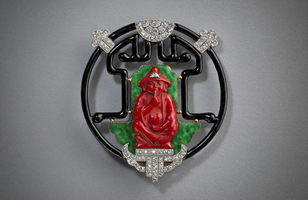 While other themes are borrowed from China, Japan, Persia and Africa, 1925 was characterised by the Tutti Frutti movement, when Cartier was summoned by the Maharaja to modernise and re-set the family jewels. With an unparalleled desire for invention and design coupled with exquisite craftsmanship, Art Deco jewellery continues to offer modernity, elegance and pleasure to a contemporary clientele. Licht and Morrison are happy to advise on any of the items in their outstanding collection of fine Art Deco jewellery.